On the Yamuna River ghats, you will come across numerous temples dedicated to various deities in Hinduism. Presented below are some of these along with the ones that we spotted while our stroll on the Vishram Ghat of River Yamuna in Mathura. Located on the banks of River Yamuna, it is dedicated to the brother-sister sibling duo of Yam (pronounced as yum) and Yamuna. 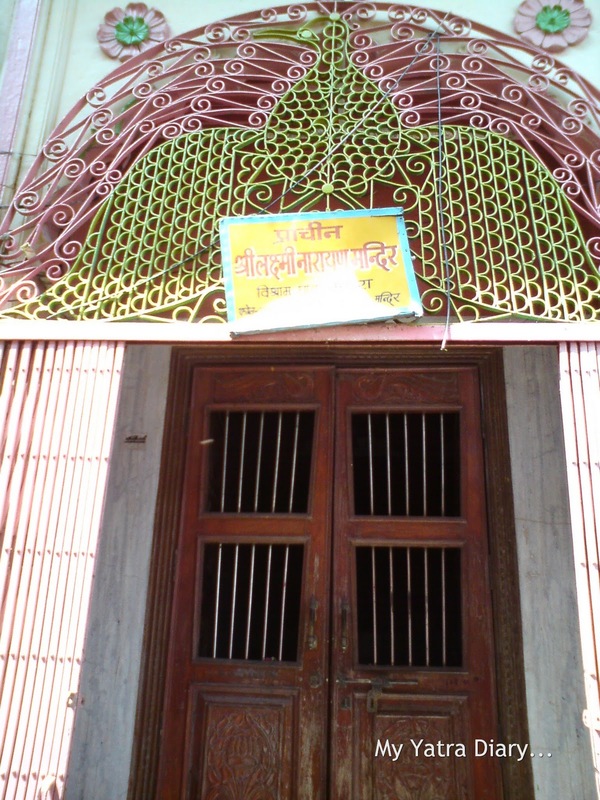 The story related to this temple is a very interesting one. It is said that once, on the occasion of Bhai Duj (the day following Diwali) Yamuna requested her brother to come over for dinner. After the dinner, as per the customary tradition, Yum insisted his sister ask for something from him. This left Yamuna confused as she already had everything and she dint know what else she could demand for. 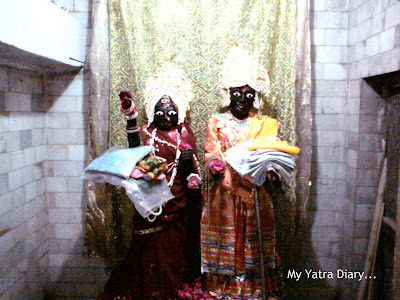 On much persistence from his brother, Yamuna finally put forth her wish – On this day of Bhai Duj, all those sisters who along with their brothers, will devotedly bathe in my waters and visit our temple together should be freed from all your reprimands and punishments and be granted liberation – that was happily granted by Yam. Keeping with that pledge, even today, on the auspicious eve of Bhai duj (the second day of Diwali) every year, the Vishram ghat gets flanked by sister-brother pair coming over from all over the country and the entire river front literally transposes into a huge sibling fair. I am blessed to have been here twice in the past on this very occasion and to have witnessed this event along with my brother, I must confess, the kind of worship that one experiences when one takes a dip with both hands tightly clutched together, that moment is beyond any expressions... it is a real wonderful feeling, full of pure idyllic love! 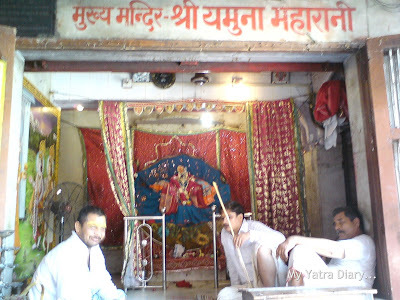 Just opposite the Yam-Yamuna Temple is situated the Yamuna Temple dedicated exclusively to Goddess Yamuna. After praying to Her on the River Ghats, devotees come to this temple and do not forget to offer their prayers here as well. 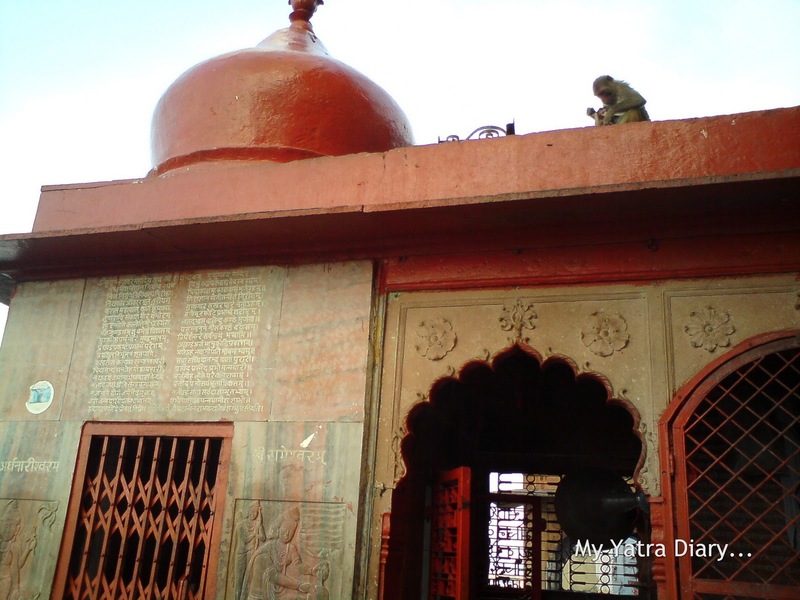 According to the ancient Hindu scriptures, after bathing at Vishram Ghat, one should visit the deity of Gatashram, which means 'refuge from fatigue'. 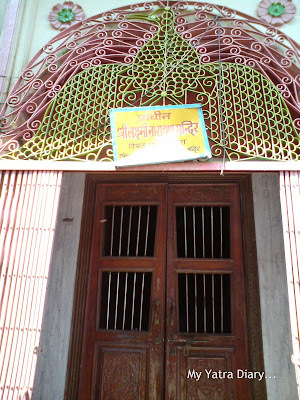 The original temple is reportedly gone, in place of which is built one that dates back to the 18th century. It houses a four armed standing image of Lord Vishnu flanked by Radha and Kubja on both sides. This place is on the other side of the Yamuna River from Mathura and one can see it during the boat ride. 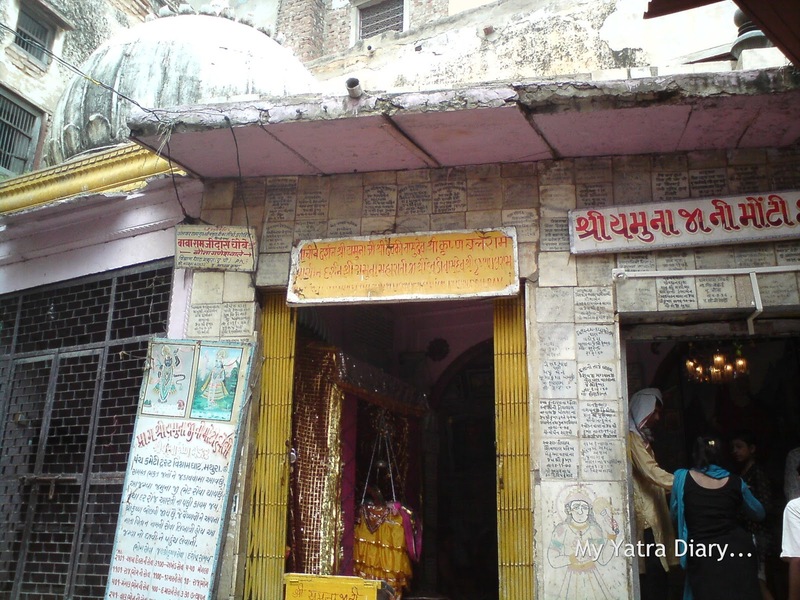 Here sage Durvasa had performed time in penance opposite the Vishram Ghat. Besides these important temples listed above, there are countless other temples dedicated to various Gods and Goddesses like Laxmi Narayan temple, Krishna - Balaram Temple, Hanuman temple, that one sights with each step that one takes here. I always enjoy your wonderful tours, Arti!! Thank you for sharing the beautiful and fascinating things about your country! Your photos are so delightful and colorful today!! Hope your week is going well! Fascinated to read of Gatashram, how wonderful. As always I've enjoyed your photographs and especially the first two as I have a love of bells. Hindu temples and ashrams are such peaceful places... great post Arti. Wonderful post- Arti. Loved the Yam and Yamuna depiction. Cute pictures of the Gods and Goddesses. Well presented. Yam - Yamuna story is new for me. Thank you for the post. asusual an enjoyable post Arti...took me to the place with your snaps! The yellow painted on the temples is such a bright, cheerful color. I enjoyed reading about the brother/sister siblings who visit the Yam-Yamuna Temple to receive their blessing. Arti, thank you for taking us on this spiritual journey. I am struck by the brilliant colors of the statues in India. Lots of red and yellow there. I always learn so much here. I really enjoy seeing the temples and their magnificent colors. I badly feel like visiting this temple town.. Great post Arti, as usual, with lot of useful info. I never read about yamuna story :), your picture make me curious.. i will read more about it, and the temple look interesting, are the building area look like varanasi? we often hear about stories about lovers and couples. this is something different. i like it. Great post and Nice photos.Thanks. Arti, you are doing such a great service through this lovely blog of yours to increase the awareness of our rich culture! 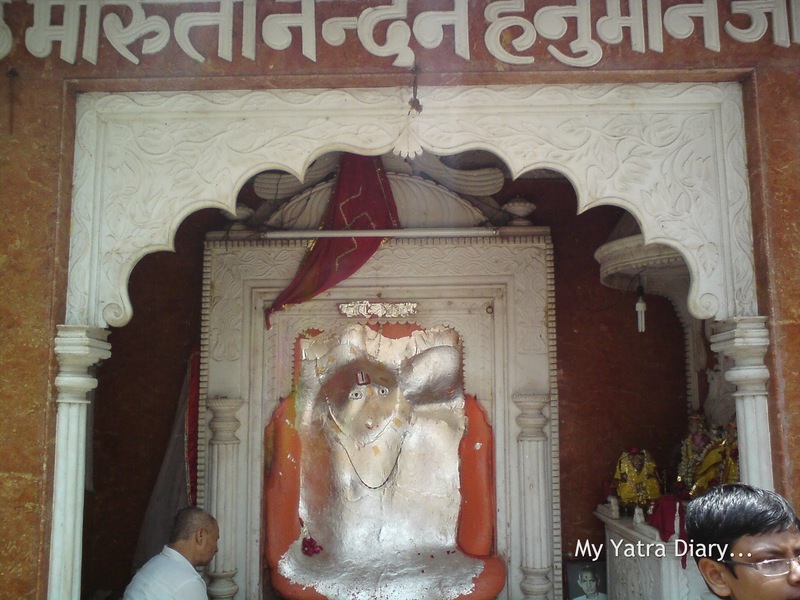 Mathura, Vrindavan, and the entire region has a history waiting to be told! Yam and Yamuna's story was quite interesting. I have never visited Yamuna near Mathgura. However it comes to Varanasi where I had a dip. 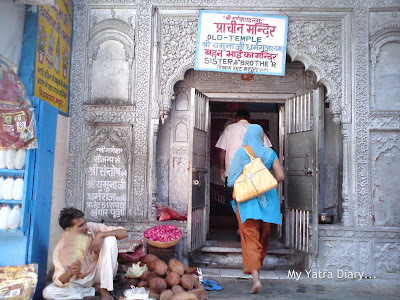 @Mareta One can say the the ghat area of Mathura including the buildings does bear a close resemblance to the ghats in Varanasi. But the ghats in Varanasi -- are ornate and more in number when compared to Mathura -- where the look is more subtle and the buildings, though ancient, are also few. It's really impressive tour. Most Japanese people don't know such places. Thanks for sharing. Lovely temples and wonderful captures . I'd never heard of Yam and Yamuna, Arti. So very interesting. I have a few wishes of my own. What a lovely place and story -- what a generous brother to take such good care of his sister! (I hope our kids are as good to each other ;>))...this post made me miss my brother though, who has been gone for many years now. Wow! My goodness, the sights are incredible and so very different from what I see day to day. You give me wanderlust. Thank you so much for giving us a tour! These are also good architect temples.I like these. Many Thanks for sharing! I love temples both for the their architecture and fro the magic athmosphere you might breath! Such gorgeous temples with yellow and some bells hanging under the gate.I always envy of your spiritual trip. That is wonderful. Thank you for taking us the interesting trip with you. Sorry,I am a late visitor,Arti. I was a bit busy for going out. I did not sit and use my computer so much these days. Arti,I am very much thrilled by your words of inspiration. Am really sorry for the delay in writing the new post.Some very important work is going on.Soon I would try. writing supported by beautiful eye-catching pictures.The comments on your post are also interesting to read and reflect pious love of your readers towards you. Thanks a lot Arti for this unique post. The story of Yam and Yamuna makes our mind warm. It's good chance that you witnesses the event with your brother. Thank you for taking me to your great tour. Great photos! All so colorful. With so many temples, I’d wonder which to visit and you gave us nice pieces of information. I like it when the Hindu temples are beautifully colorful, I like the yellow, silver, and blue... but if I had to pick a favorite (though it’s hard), I’d go for the seventh with the chic color tone. it's been so long since i last visited yamuna ghats!!! It is very moving story with our brothers and sisters, Artie! And I am glad to feel the ultimate brotherly love! The photos you filled so nice colors and interesting information! Hey Arti, please collect your award from here. I am not familiar with this part of the world and Bhai Duj. Thank you for explaining it and posting pictures of the temples. I rad something about Hanuman. I always relate Hanuman to Sun WuKong, the main character in the classical Chinese epic novel Journey to the West. Amazing photos. Loved the Hnumanji's morthy. Thanks for enlightening us on the story of Yam - Yamuna. These temples are all so different, I think the one with the pastel colors is the prettiest. Do the visitors feed the monkeys? Nice post Arti, and even for you and your brother to be on this ceremony. Beautiful colorful. I have a Filipino blogger who lives in Malaysia, and he introduced me to some of customs and traditions. I am very interested in the Hanuman temple! In Nara-machi, there is a hall of the blue-faced deity whose messengers are monkeys. So on the roof or under the eaves of his small hall there are lots of monkey statues and dolls. I have heard the story of this white monkey with magical powers. I enjoy your stories always, and find something similar and familiar with our culture sometimes. It is a great delight for me. Arti, thanks a lot. Interesting place. Enjoyed reading about it. Happy to learn about Bhai Dhuj tradition and story of Yam and Yamuna. Here the Yam is the same Yama - God of death? Never knew Yamuna was his sister. Yes, Yama or The God of Death is the brother of Yamuna. They are also siblings to Shani. Their father is the Sun God, Surya. 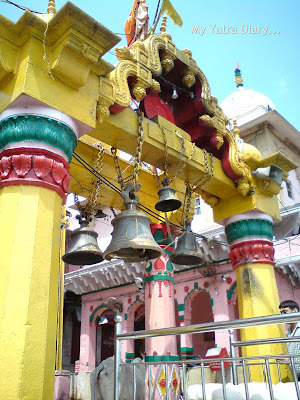 Temples in India are a whole lot cooler and more colorful than other places in the world. Love 'em! That was a fantastic tour of temples along the Yamuna along with lovely pics. I love the story of the sister and brother how it has created the tradition for today. A way of bringing family together. 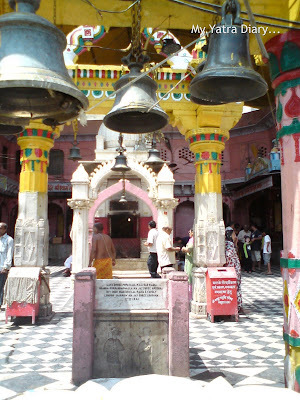 can somebody throw light on gatashram temple. 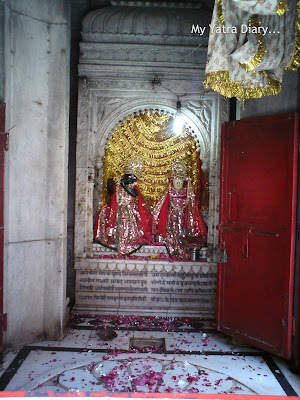 diety is vishnu avtar or relate to kubjs-radha??? ?